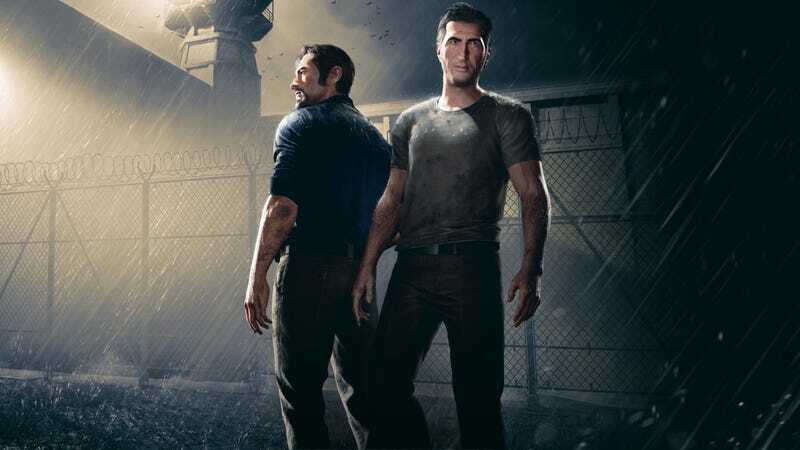 When “A Way Out” was revealed last year, I wasn’t entirely sure what to think. It was this odd out of left field game, on EA’s stage no less. A game that wasn’t singleplayer, but also not your average multiplayer game. It supports only two players, it’s cooperative like a lot of recent games, but it treats its coop like split-screen couch coop even if you’re playing over the internet. Best part is, only one person actually needs to buy the $30 game. The second player only needs to download the friend pass version of the game. It’s the full game, but they can’t set up games. In order to play, they require a person who owns the game to host. And after 3 and a half hours with the game, I can already give it high marks. The story is simple enough that I don’t need to really explain it to you, so I’ll simply dive right into why I love this game already, and my friend agrees with me. Early on in the game, both players are placed in the prisons recreational yard, two different sections. While one player has an objective, the other does not. I was the one that did not have a real goal. So, to pass the time, I started exercising. My friend decided to screw around a bit before going to the objective, so he too decided to do some exercises. To perform them, you mash the “E” key on PC. As you do more and more reps, it gets increasingly difficult. My fingers hurt by the time I gave up. But before that happened, me and my friend decided to challenge one another. We set a number of reps and started at the same time. I won the first round, then he cheated and used the handle of a fork to mash the button so his finger wouldn’t wear out. In the end we laughed. And what set this apart from other coop games is that I could see my friends screen right next to mine as if he were sitting right next to me. As we progressed through the game, we ran into many moments like this where we had to communicate with one another, and this was made easier because we could see each others screens. We were able to time out movements perfectly because we could see each other. Of course, some scenes put the two together because there was no need for two separate views. This was the case with a scene where we had to scale a wall, back to back. If one player got too far ahead of the other, it would fail, so we had to sync ourselves in order to avoid that problem. We began counting down from 3 in order to keep ourselves in sync, watching the others bar for extra accuracy... that last part failed, so we stopped doing it and stuck to the counting. Towards the end of our session since I had to go to bed in order to get some sleep before work, we found ourselves rummaging through a house. Instead of going right for the objective, we ended up playing around with everything we could interact with. The highlight, of course, ended up being a painting that Leo could draw a mustache on, and Vincent could erase it. My friend drew it, I found it, erased it, and when I left the house, he drew on it again. I just laughed. Ultimately, we settled our differences with a game of horseshoes in that same chapter. He scored 16, I scored 21. Needless to say, he demanded a do-over. He got 21, and we called it even. Moments like that truly make the experience. Of course, there are plenty of story-related moments where you have to work together and communicate if you want to get through. In one instance, we split up while being pursued by the police. I stepped out from some bushes and alerted an officer. He hadn’t completely seen me yet, his gauge was still going up, but it was filling fast and I couldn’t move fast enough to get out of his view. But my partner noticed via my screen and my reaction, snuck up behind the officer, and knocked him out, saving me. In another instance, I gave him a boost up onto a ledge. I waited at the bottom, assuming he’d hoist me up, but he got caught in a cutscene and I needed to find another way up. He was being arrested, so I had to get to him before the officer could get up to him. I barely made it and knocked the officer out, using his screen to keep tabs. At the end of the night, we both walked away satisfied(Of course, he didn’t pay anything for the game, so there’s that.) and agreed to come back to it at our earliest convenience. But we both agreed that as a cooperative game, it was something special. Not necessarily groundbreaking, but it’s fun and unique, and to us that’s all that mattered.